Over the past 75 years, gays and lesbians have experienced tremendous social change in America. Gay and lesbian culture, once considered a twilight world that could not be spoken of in daylight, has become today's rainbow families, marriage equality victories, and record-breaking pride celebrations. For a medium-size Rust Belt city with German Protestant roots, Milwaukee was an unlikely place for gay and lesbian culture to bloom before the Stonewall Riots. However, Milwaukee eventually had as many--if not more--known LGBTQ gathering places as Minneapolis or Chicago, ranging from the back rooms of the 1960s to the video bars of the 1980s to the guerrilla gay bars of today. As a lifelong Milwaukeean, Michail Takach became fascinated with its nightlife culture, venues, and neighborhoods at a young age and has committed himself to researching and documenting those stories not told in history books. As the communications director for Milwaukee Pride, Inc., Takach has supported the ongoing celebration of LGBTQ culture and community through education, outreach, and advocacy since 2010. 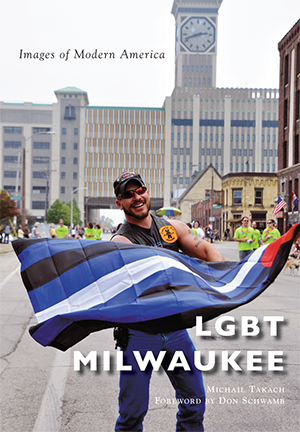 In partnership with award-winning historian Don Schwamb of the Wisconsin LGBT History Project, Takach seeks to make the story of LGBT Milwaukee accessible, visible, and portable for future generations--before it is too late.